1 BRITISH STANDARDS INSTITUTION. BS EN 1992-1-1, Eurocode 2: Design of concrete structures - General rules and rules for buildings. BSI, 2004. 5 BRITISH STANDARDS INSTITUTION. 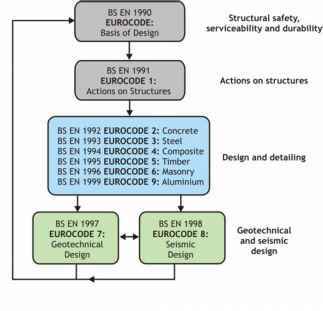 BS EN 1992-1-2, Eurocode 2: Design of concrete structures. General rules - structural fire design. BSI, 2004. 6 DEPARTMENT OF COMMUNITIES AND LOCAL GOVERNMENT. Handbook to BS EN 1992-1-2. DCLG, due 2006. 8 BRITISH STANDARDS INSTITUTION. Background paper to the UK National Annex to BS EN 1992-1-1 and BS EN 1992-1-2. BSI, 2006. 9 PALLETT, P. Guide to flat slab formwork and falsework. Construct, 2003. 10 BRITISH CEMENT ASSOCIATION. Prefabricated punching shear reinforcement for reinforced concrete flat slabs. BCA, 2001. How to reference eurocode and national annex?